We played life cycle puzzles online and in the math center.We used floor puzzles, foam puzzles and table puzzles. We created a butterfly memory match game from online photos. We played a memory match game online. How many each? How many all together? To play this game we used photo print outs of male and female monarchs. 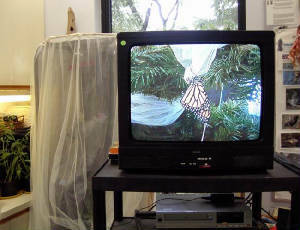 Our participation in A Dance With the Butterflies enabled us to view other children's work online. The children loved the story A Butterfly Egg written by Ms Dukic's grade 3 library club in Hong Kong.We looked for their location on the globe and on maps. We searched online for butterflies that are indigenous to each of our friends locations. Our participation in Journey North and the Symbolic Migration is documented on the Monarch Page of our classroom website . You will find more resources related to Monarchs and the culture of Mexico there! We sang and acted out this wonderful Butterfly Life Cycle Song by Suzy Gazlay.Ms. Gazlay was kind enough to give us permission to post it here. We were also visited by "Butterfly Dancers" from BCC's dance club. 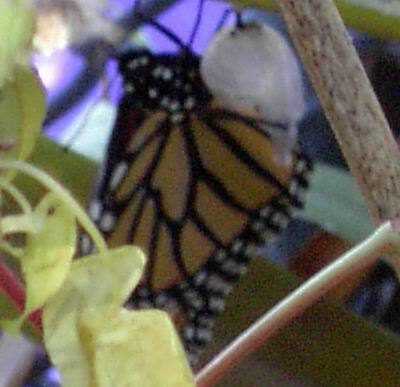 We used digital cameras,scanners and video to record and document butterflies, caterpillars and children’s work.We were able to record a monarch's emergence and watch it live,on video . and more Butterfly Movies . We brought a lap top to circle time to share cd roms and digital stories .We listened to the story Caterpillar Dreaming Butterfly. Microsoft Word and Kidspiration were offered at the computer station to inspire young writers. Children were encouraged to write poetry, songs and stories. We provided butterfly life cycle puppets for the puppet theatre and life cycle rubber stamps and journals in the writing center. Wood was on hand for use in creating garden signs. To inspire creative play,we turned our dramatic play center into a "garden". 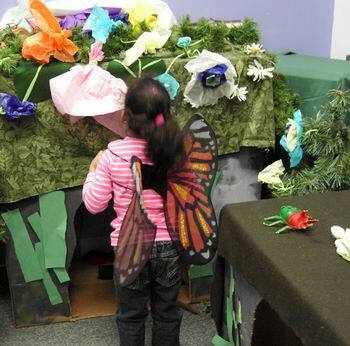 We provided butterfly wings and children helped create box "bushes" for caterpillars to crawl on,under and through. Click to See (and hear) the children's work. ..and is recorded and observed on the VCR! At the core of our science curriculum,children were given the opportunity to observe,investigate,raise questions, and record experiences as we raised and witnessed the metamorphosis of Painted Lady and Monarch butterflies in our classroom. We took a look at caterpillars and butterfly specimens with the aid of microscopes and hand held lenses. We continued work on our Butterfly Garden and habitat. We used venn diagrams to compare butterflies and caterpillars to our selves. We also compared butterflies and moths. We played butterfly matching games. 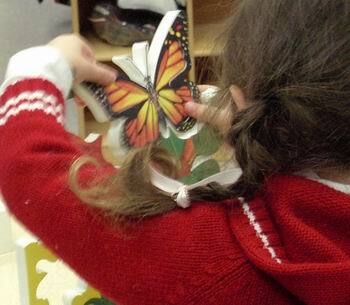 We used butterfly life cycle replicas in the sensory tables to inspire creative tactile play. We used garden themed playdough mats and accessories to inspire representation. We provided a wide variety of mixed media in the art and woodworking center to inspire children's creativity.